Select Medical news | What makes Flexi Crossover System Different? The new crossover Flexi system is a unique proposal. It brings together the very best in alternating therapy combined with a static mattress, without compromising on comfort or efficacy. Using the proven technology of Select Medical’s ‘Figure 8’ cell design as the starting point for the crossover system, ensures that all the benefits of a truly alternating surface are combined with high density CMHR foam to deliver effective pressure area care. Flexi brings together a number of unique features to truly set it apart from other ‘hybrid’ systems in the marketplace. Flexi’s Axis Technology works in combination to provide a gentle alternating cycle that encourages a natural body movement intended to assist with continual repositioning of the cared for. Existing ‘hybrid’ technology derives its design from traditional static mattresses. Rectangular wrapping of foam to create air cells can lead to large gaps between the cells, whilst alternating cells positioned under foam means true alternation therapy can be compromised. For many years Select Medical have been manufacturing pressure area care mattresses using the patented ‘Figure 8’ cell design. Using this proven technology as the starting point for the design of a crossover system means that it delivers all the benefits of a truly alternating surface, that can be easily stepped down when no longer required. The high density CMHR foam continues to deliver pressure relief when in static mode. The unique ‘I’ beam cell construction ensures that no ballooning of the cells can occur, which can compromise the comfort of the cared for and create peak pressures. Inflated air cell pressures in the active state can remain low, providing an increase in surface area to ensure optimum immersion at all times and deliver enhanced comfort levels. Axis Technology works by combining a longitudinal cell orientation over a convex base to deliver high levels of comfort and support. The patented design provides a gentle alternating cycle that encourages a natural body movement intended to assist with continual repositioning of the cared for. Unique cell orientation: Flexi is the first crossover system to use a longitudinal cell design over the torso area. 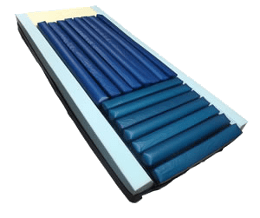 Designed to prevent the patient from falling between air cells, it also allows carers to carefully glide their patient across the torso section and up the mattress in formation with the longitudinal cells, limiting friction and shear forces over traditional horizontally arranged surfaces. Convex base contour: Encourages the cared for onto their side as part of their repositioning regime. This natural and gentle movement of the body ensures the cared for regularly change their position across each alternating cycle. Dedicated heel zone: The combination of the longitudinal cells and the narrower, horizontally arranged heel section delivers a true heel zone for off-loading peak pressures in this vulnerable area.